Our durable channel systems provide a sleek continuous design for pool fencing and balustrading. Top mounted, side-fixed or recessed fixing options are all available in a range of finishes. A rotating pressure plate system allows for a 30mm tilt and lock adjustment, backwards and forwards. This reduces issues arising from uneven sites or deck movement and allows for easy adjustment. We have been measuring designing and installing a variety of mini post balustrades for over two decades. We know every potential issue to watch for. We dont cut corners.. and we know all the rules! 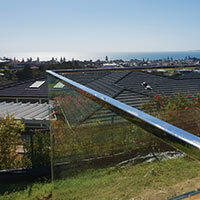 Channel is manufactured from architectural grade aluminium with anodised covers for added durability. The channels ability to accommodate 12mm up to 21.52mm thick glass means this system is ideal for use in homes, apartments and commercial projects. Heavy duty 6063 T6 grade aluminium construction with anodised covers for extra durability. Available in satin anodised as standard with a selection of custom powdercoated finishes possible to match or compliment cladding / decking. A discrete recessed option is possible where channel can be embedded into the structure for 'invisible' hardware design. 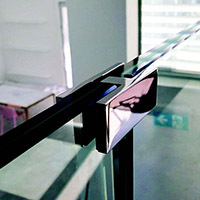 Handrail, clips and brackets are co-ordinated and can be powdercoated to suit the colour / style of the channel.